Next there is a burdock bush. "Now if there was a rabbit right at the base of it, I'll bet I'd get him." A quick draw, a snappy release and the arrow speeds clean and true—right through the imaginary bunny. "That's shooting," say you. You walk a bit more and catch up with a friend. "Let's see you hit that telegraph pole, bet you can't." You nock a shaft—a favorite one, for now you're shooting under the eyes of a skeptic and critic. You take careful aim, loose perfectly and—a real thrill—you hit the pole dead center. "Gosh, you hit it!" "I'd like to shoot too, must be lots of fun." You affect indifference, as if socking a pole at that distance—all of forty yards—is nothing at all, and begin telling him something about bows and arrows. 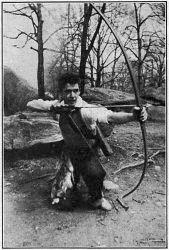 Years ago, in England, the home of the yeoman and long bow archery, elaborate roving courses were laid out. One of the famous ones, built about 1594, was near London and was called Finsbury Fields. The names of the butts or targets breathe romance and adventure. From The Castle to Gardstone was 185 yards: from Turkswale to Lambeth was 75 yards; from Bloody House Ridge to Arndol was 154 yards. From the Scarlet Lion to Jehu was 82 yards.